Cardiovascular research has shown that patients who gain comfort and strength from religion/spirituality and who participate in social and community groups have a lower mortality rate during the six months following cardiac surgery than those who were deficient in these categories, although a recent study found that knowledge of receiving prayer was actually associated with a higher rate of complications. In a recent article in the Mayo Clinical Proceedings, Edward Creagan, MD, wrote that "cancer survivors may be spared for reasons that are not clearly understood, and that among the coping methods of long-term cancer survivors, the predominant strategy is spiritual." It is still recognized that the biology (aggressiveness) of a cancer is the most important determinant in the life history of a cancer course, but religion or spirituality may be an important component of successful coping with the course of the cancer. There is considerable current interest in spirituality and religious faith as resources for those with cancer. At times of extreme vulnerability, we all tend to pay more attention to our innate spirituality and seek to restore a feeling of being connected with the universe or a spiritual idea beyond ourselves. We may seek this connection through prayer and a renewed devotion to religion or spirituality, or through ritual exercise such as yoga, tai chi, or meditation. One aspect of your quality of life concerns your sense of peace or acceptance. Survivors who do not participate in a formal religion but who never consider themselves spiritually involved often feel that their spirituality has been deepened through their experience with cancer. Some reflect on the suffering of humankind through the ages and feel that by having cancer they are participating in one aspect of what it means to be human. Some patients find peace in a kind of surrender to the mystery of a higher spirit and trust in some larger reality a divinity or intelligence, or a purpose that gives meaning to their suffering. Spirituality also plays a role in end-of-life care, helping patients utilize their remaining time to achieve a sense of peace and purpose, even in their final weeks, days or hours. Spiritual practices can strengthen feelings of hope or give meaning to life prior to death. They also provide an effective means of self-soothing during stressful periods. It has been estimated that about 80% of religious people believe in some form of heaven (afterlife), that your spirit or soul will not die, but will live on as part of your legacy, remaining an everlasting memory of your family. Philosopher Joseph Campbell said "We don't know if there is a heaven, hell, or afterlife, so we should act as if this life is all we get." Religious and spiritual practices may offer opportunities for social support, self-soothing, and a sense of being protected and cared about that can be helpful to many cancer survivors. 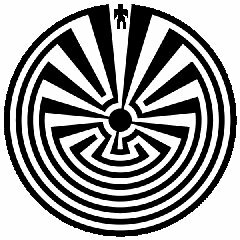 The figure represents an individual's path through life with its twists and turns in which he gains wisdom and knowledge. Before approaching death he reflects on the wisdom he has gained and then, in harmony with the world, he accepts his fate.